Today we're going to talk about the upcoming visit to China of Indian Prime Minister Narendra Modi, who served from 2001 to 2014 as chief minister of Gujarat and was sworn into office almost one year ago this month. Modi's visit comes at an interesting time in Sino-Indian relations, following closely on the heels of recent Chinese summitry with India's arch-rival Pakistan and the closing of roughly 46 billion dollars in investment deals in the region. Joining Kaiser Kuo and Jeremy Goldkorn for this discussion are two friends and experts on Sino-Indian relations: Ananth Krishnan of the India Today Group, and Sutirtho Patranobis of the Hindustan Times. This is a fun show and we're delighted to have such insightful guests. Join us as we get the background politics on Modi's visit, make occasional side-forays into Bollywood, and even discuss Modi's strange and celebrity happenings on Twitter. New to Sinica? If you'd like to get notified when new episodes are available, subscribe to our private RSS feed using iTunes or your preferred RSS reader. All listeners are more than welcome to download our show as a standalone mp3 file directly from the site for saving or sharing with friends. Enjoy! A total of fifty-seven countries have now joined the Asian Infrastructure Investment Bank, China's newly-launched competitor to the Asian Development Bank that has sparked a flurry of objections from the United States, even culminating in a failed diplomatic campaign by the superpower to lobby allies including the United Kingdom and Australia to abandon the organization, whose stated mission is funding infrastructure projects in underdeveloped parts of Asia. Although the news has passed mostly unnoticed in the American media, the political furor has raised questions about the future of the Bretton Woods system and China's place in it: what are the American concerns over the AIIB and is there any validity to them? Why is China attempting to setup a development bank outside the Bretton Woods framework, and what actions may have triggered the Chinese move? And quite specifically, how does the AIIB compare to its competitors both in capitalization as well as its power in the region. It was also fun to be reminded (read: actually know for the first time) how many people are in the world (7.2 billion) and how many languages there are in the world (7102). One of the things we're proud of at Popup Towers is our hard-fought ability to wring natural dialogues out of less-than-natural voice-actors, a skill that usually involves unleashing Grace at them in varying degrees of rage. And since recording a dialogue this way can take up a bit of time, the result is that we usually end up with a number of variants for each one, usually getting more and more natural as we go along. If you're totally new to Chinese we suggest coming back to this show later -- the lesson is a bit tricky for the Absolute Beginner level -- but we wanted to showcase it here for two reasons. The first is that this show features not one but two dialogues. The interesting thing is that the first dialogue sounds a bit stilted while the second sounds extremely natural. And since they basically saying the same thing, we wanted to contrast and compare them, to learn what it is that makes mandarin sound forced and what makes it more colloquial. Last week Harvard doctoral student Jennifer Pan and MIT graduate student Yiqing Xu co-released a paper on "China's Ideological Spectrum" that has garnered a tremendous amount of attention in China-watching circles. And the reason for the fracas? Their paper uses data from the Chinese Political Compass to try and map out Chinese ideological tendencies and surprisingly discovers that China's ideological spectrum may be more uni-dimensional than it seems. If you've been reading the Chinese blogosphere for a few years, you might remember our guest from a series of blog posts he wrote in 2007 while working as the only foreign "hair-washing trainee" in a Fuzhou hair salon. Sociologist Ben Ross has since moved on to become a doctoral student at the University of Chicago, where he focuses on Chinese labor migration and related issues. Yesterday evening, Kaiser Kuo and David Moser were delighted to be joined in Popup Towers by Rogier Creemers, post-doctoral fellow at Oxford, author of the fantastic China copyright and media blog, and one of the most informed academics working on Chinese Internet governance. We've always enjoyed our previous chances to grill Rogier on his thoughts, and our discussion this week didn't disappoint either. Fewer and fewer people are taking graduate-level Japanese classes in U.S. universities, according to data recently released by the MLA. 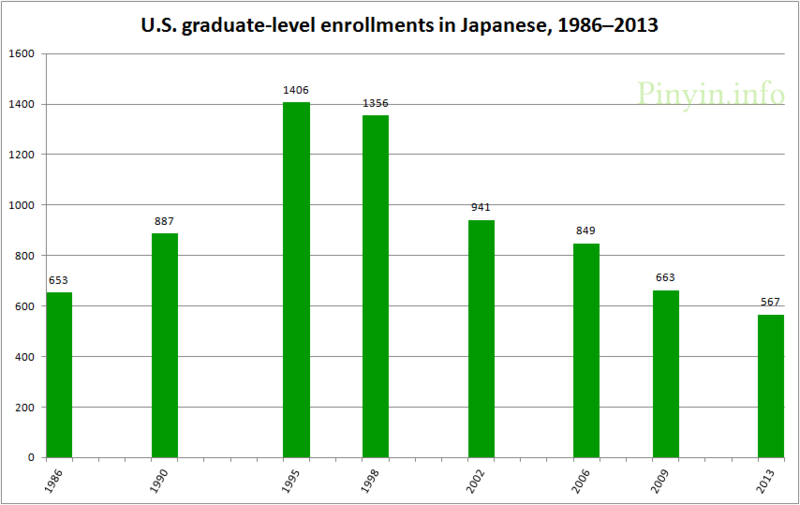 Graduate-level enrollments in Japanese classes are at their lowest level since 1983 and have declined to less than half of their peak level, which was reached in 1995. Here are a few more years. When looking at the earlier peaks, it’s worth remember that there are a lot more people in graduate school now than there were several decades ago, both in absolute terms and as a percentage of the population. 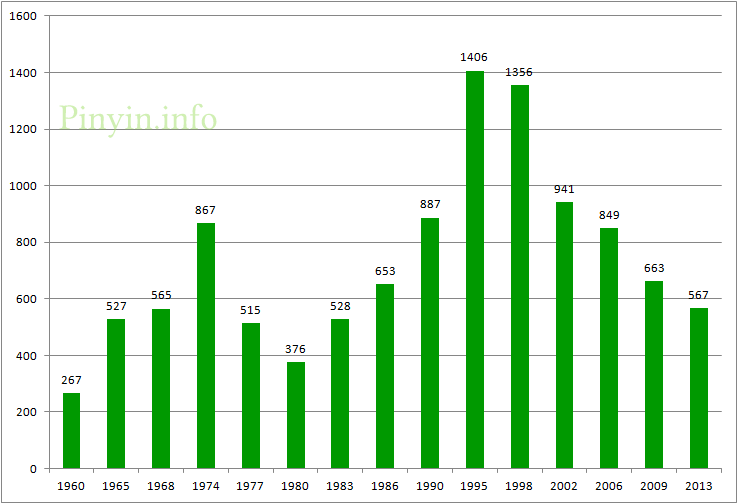 So the recent figures are even more bleak than they might appear at first glance. You might be wondering how Japanese stacks up against another Asian language. 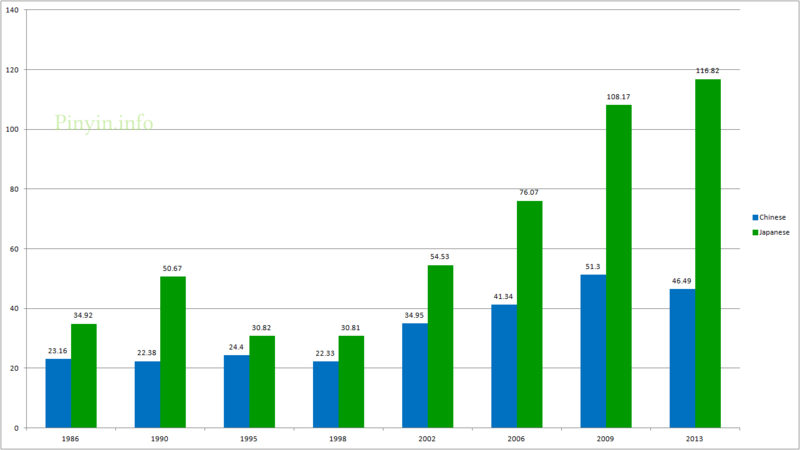 Here’s a comparison with graduate enrollments in Chinese (in blue). Again, the situation isn’t looking good for Japanese. 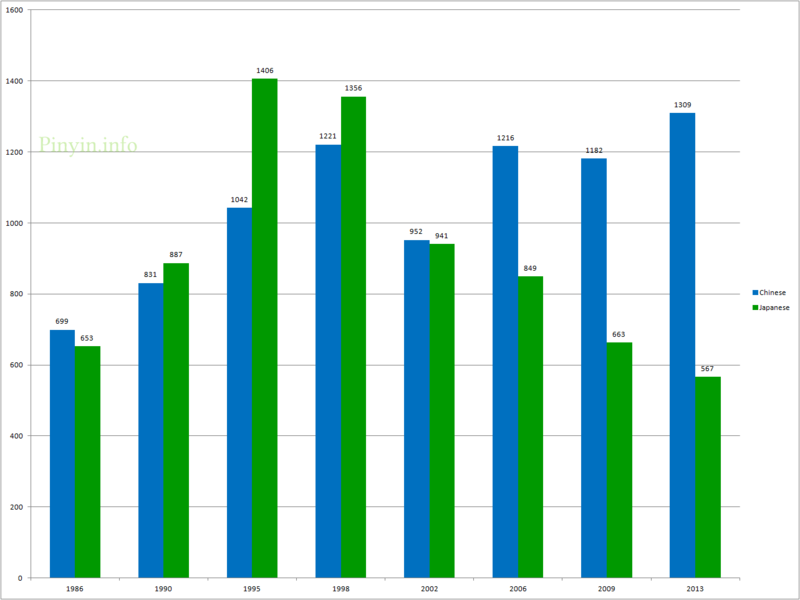 And here’s a look at the number of undergraduate enrollments in Japanese (green) and Chinese (blue) per enrollment in a graduate course in the same respective language. Even so, boosters of Japanese may take heart that there are still more post-secondary enrollments in Japanese than in Mandarin. But more on that in a later post. This week on Sinica, we are delighted to be joined by Lucy Hornby, China correspondent for the Financial Times, and author of this phenomenal piece on China's last surviving Chinese comfort women, and their longstanding and often futile attempt to seek reparations in both China and Japan. Join us today as we talk about this piece, but also other stories of reparations and post-war politics that may leave you - like us - somewhat less cynical going out than coming in. Enjoy Sinica? If you want iTunes to download new episodes of Sinica automatically as we publish them, feel welcome to subscribe to our Sinica RSS feed. You can also find Kaiser on Twitter at @KaiserKuo and Jeremy at @danwei. And here is the standalone MP3 file too. We hope you enjoy the show. This week, Kaiser Kuo and David Moser are delighted to be joined by Michael Meyer, the author of The Last Days of Old Beijing and now In Manchuria, a part literary travelogue and part journalistic account of three years spent living with family in rural Jilin. Starting with stories of crime and punishment on the rural bus network and the ever-delicate question of where rice tastes best, our podcast moves on from the personal towards the broader subject of how Jilin's agricultural economy is transforming in the face of market pressures. And we also talk about the past, in the area's Manchu footprint and its continuing legacy from its period of Japanese occupation, both of which can still be seen as much from the people themselves as well as the monuments and cemeteries in the region. Note: care to get notified when new episodes of Sinica are released? If you use podcast software like iTunes, try subscribing to our free Sinica RSS feed. We welcome everyone to listen to the show online, but if you'd like to download this show to share or just save for later, go for it: here is the standalone mp3 file. Note to Listeners: we tried to keep this show focused on classical music, but then Grace kept mentioning how much she doesn't like Taylor Swift, and David felt forced to wave his populist flag, and that is how our podcast descended into nonsense shortly after our two hosts offhandedly diagnosed the vast majority of the Chinese population with obsessive compulsive disorder. "Under the Dome," Chai Jing's breakout documentary on China's catastrophic air pollution problem, finally hit insurmountable political opposition last Friday after seven days in which the video racked up over 200 million views. The eventual clampdown raised many questions about the extent of internal support for the documentary. In this episode of Sinica, Kaiser Kuo and David Moser interview Calvin Quek of Greenpeace, who works on pollution problems and has significant experience lobbying the private sector to curtail investments into the worst-offending, environmentally unsustainable technologies. We are also joined by Peggy Liu, chairperson of JUCCCE (Joint US-China Collaboration on Clean Energy), a non-profit organization focused on Chinese government training and other green initiatives. Enjoy Sinica? Get notified when new episodes are published by subscribing to our dedicated RSS feed. You are also welcome to download this show as a standalone mp3 file. Thanks for listening and please send us comments and feedback by email at sinica@popupchinese.com. "What have I done, and what am I doing here?" This week on Sinica, Jeremy and Kaiser are joined by two old friends from the 1990s, Jessica Meider (now a professional musician) and Jonathan Ansfield (now a professional journalist). We don't chat much about, but if you're a long-timer in Beijing, or just curious what it used to be like, join us as we look back at youth, music and share tips on how to do a backflip in a PLA-owned bars. "Murdering a guy together is how you really get to know someone...."
So begins our discussion with James Palmer, and you won't know how badly we're twisting his words out of context until you listen to the full show, which starts with us grilling James on "what you have to do to be part of Chinese business culture" and descends from there into stories of the sort of booze-and-ketamine-fuelled business dealmaking that seems to consist of a large amount of male business culture in China. But why? And what is happening to the whole industry under Xi Jinping's recent crackdown? Haven't heard of our guest yet? James Palmer is one of our favorite long-form writers on contemporary China, who counts among his China-related books The Death of Mao: The Tangshan Earthquake and the Birth of the New China (short-listed for the John Llewellyn Rhys Prize in 2012). James is also the author of a number of fantastic pieces from AEON magazine on China's post-1980s generation and the deliberate marginalization of the disabled. We hope you enjoy the show as much as we do. iTunes has been spotty for everyone in China since the New Year. But if you are outside China and would like to use it to keep up-to-date on the Sinica show, you can subscribe using our private RSS feed. We also invite everyone to download this show as a standalone mp3 file to share with your friends. If you have questions or suggested topics, feel free to reach out to us anytime by email at sinica@popupchinese.com. Qing Wen - When To Use “不” bù and “没” méi? This week on Sinica, Jeremy and Kaiser are joined by Jonah M. Kessel, former freelance photographer and now full-time videographer for the New York Times who has covered a wide range of China stories, traveled widely through the country, and produced a series of great videos on everything from the Foxconn scandals and the Southeast Asian heroin trade to more practical coverage on how to walk your cabbage. Join us as we talk to Jonah about his work and his experiences in China.